Hidden away in the Berkshire countryside is one of the best sandwich joints you’ll ever find. The Joint: The Pineapple, Lake End Road, Dorney Lake, Windsor, SL4 6QS. You can view their website here. 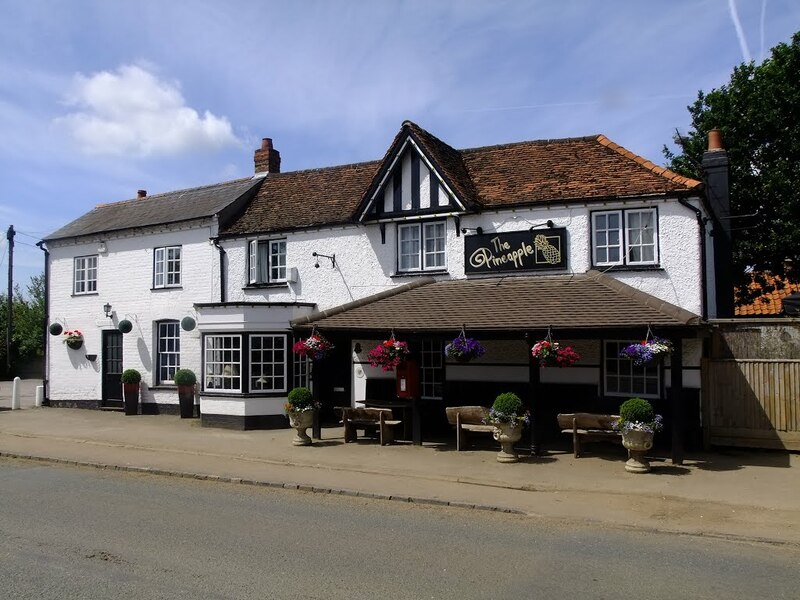 The Vibe: Looks can be deceiving and at first glance The Pineapple, seen above, does look like your average countryside pub in yet another English village. It’s pokey, slightly dated in decor, and has a standard beer garden for the brighter days. However the food on offer is far from standard. The Pineapple has been quietly churning out some of the best sandwich choices in the last ten years and a trip here is an absolute treat. By our count there are over ninety varieties of filling, five choices of bread, three different sides, and a fully stocked bar to wash your lunch down with. That’s over 1000 different combinations! The sandwich fillings range from the basic cheese and ham (Wedge Ham United) to the turkey, pastrami and mild mustard (Yankee Doodle), or the meat free Brie and white grapes (French Vine). There’s even a seafood menu featuring the likes of smoked salmon and blue cheese (Play It Again Salmon), and a dessert menu with sliced bananas and chocolate. There truly is something for everyone’s palate and the menu does take some time to digest. 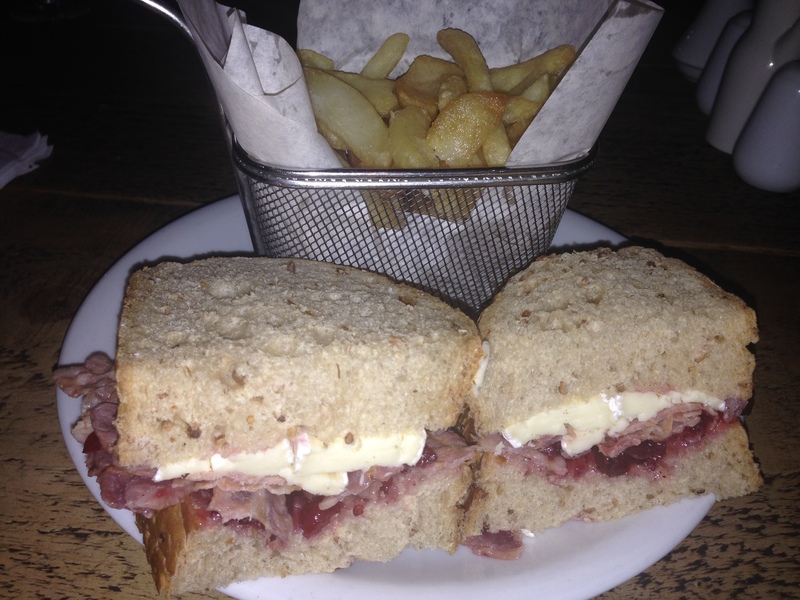 We’re stoked when our BBC (Bacon, Brie, and Cranberry) sandwich on wholemeal bread and a side of chunky chips turns up. The portions are huge and they don’t hold back on the bread. Between the thick slices is a mound of brie, fistfuls of crispy bacon, and a generous spread of cranberry. It’s creamy, meaty, and fruity all at once. An impressive three punch combo.The hot chunky chips give us that hot / cold combo too. It’s like the Super Street Fighter of sandwich joints and it’s well worth a diversion from your day at Windsor Castle. The Price: £7.95 for the sandwich and chips, and a few pounds for the pint of coca-cola we downed. It feels cheap when you’re this full. HAVE YOU EATEN AT the pineapple IN dorney? IF SO TELL US HOW YOU GOT ON OVER AT OUR TWITTER PROFILE – @OUTFORLUNCHBLOG. Posted in Windsor, UKTagged bacon, bananas, berkshire, best pubs, blue cheese, brie, cheese, chips, chocolate, cranberry, dorney lake, grapes, ham, lunch, pastrami, pub lunch, queen, sandwich, smoked salmon, the pineapple, turkey, windsorBookmark the permalink.